"I'm not going to tell you exactly," Winslow said. 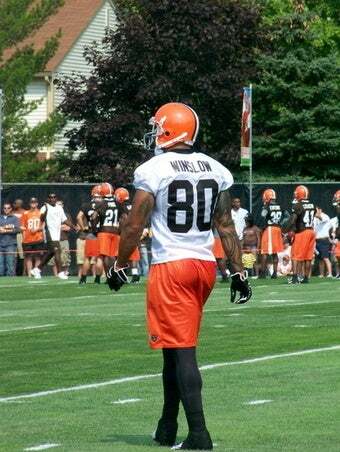 "It was really the Cleveland Browns' decision to keep it undisclosed and I agree with that. Just because I catch a football doesn't mean I should tell what's wrong with me or what happened. I'm back and I'm happy to be back. I think I'm good to go. "I just feel because I play professional football and can catch a football, it doesn't mean I should let people into my personal business." The AP story states that Winslow would not confirm nor deny that he was hospitalized due to an "infection." Winslow was in good spirits, though, and joked with reporters that he's determined to play this weekend if the team lets him. "I'm a soldier," he said with a laugh while referencing the infamous postgame rant he made as an All-American at Miami. "I can joke about it now, man. It's just playing football. You're going to have to deal with pain, and this league is what have you done for me lately? I just enjoy being on the field."